"Seeping Spring," discovered when a town was being platted as the Keya Paha County seat, was the impetus for its name, "Springview." In Springview, living is simpler, a little more complicated than in the past, but for most, life still equates to ranching, family, and church. Friendliness still abounds. You'll meet real down-to-earth people ... ranchers, farmers, and just plain, ordinary middle Americans. Like yesteryear, this is a community ... where a stranger can't pass another without giving a wave ... where a church supper or a family reunion can be the biggest event of the year. Enjoy our panoramic views, hiking in the canyons, canoeing, tubing, and wading in the Niobrara. Hunt deer, turkey, pheasant, and coyote. Find good fishing in ponds, lakes and streams. Camp out in our rustic campgrounds. Take the whole family to the all popular Saturday night dances. Experience an old-time county fair and rodeo at one of our neighboring counties historical fair grounds. Explore the extraordinary Canyon by foot, horseback, wagon or tour vehicle. Here, learn about the horse thieves and outlaws that once hid out in these 50 miles of sprawling canyons, and the vigilantes who brought them under control. These notorious outlaws include such legends as "Doc" Middleton, Kid Wade and The Pony Boys. Explore their old hideouts, trails, and hanging stations. No horses, nor carriages will be seen on Main street. Yes, a little blacktop, empty buildings; but little else has really changed. Many of the the town's structures still retain much of their original character. An ag based community, Springview remains a full-service town with a bank, a cafe, a bars, a well-stocked grocery store, a very special library, five churches, gas station, and an old line weekly newspaper, The Springview Herald. There are also two farm machinery service centers, three auto repair shops, and a well-maintained recreation area which includes a nine hole golf course with sand greens, a baseball diamond, a roping arena, mud track, pulling track. It also has camper pads available with a modern restroom/shower facility. Exceptionally good schools and an outstanding fire department with ambulance services are also a part of this nostalgic community. 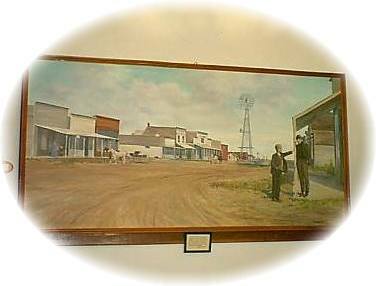 The Keya Paha Historical Society welcomes you to experience 100 years of County history come to life, by beginning your visit at this unique museum in Springview. Here, inquire about guided tours, lectures, and historical events of the county.